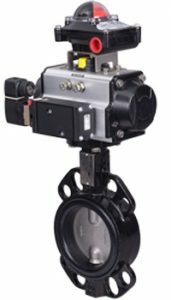 Actuated valves comprising of electric and pneumatic actuators, positioners, and process controllers play a key role in modern process automation. They deliver reliable, hardworking, and truly effective solutions. Take for example butterfly valves. Butterfly valves have expanded operators’ capabilities tremendously, providing one of the most effective solutions for process control. They are used in larger sizes in food, pharmaceutical, biotechnology, medical, water treatment, petrochemical, and oil and gas sectors. They are generally a better choice for isolation above 4” due to their weight reduction when compared to other types of valve. This in turn makes them easier to handle and install. Lower torque means smaller actuators, resulting in further weight savings and reductions in cost. Butterfly valves can be offered in various body and liner options with sealing in resilient soft seat, double and triple offset in wafer, lugged, and double flanged pattern with PN and ANSI drilling. Team these with electric or pneumatic rotary actuators and a range of options that include limit switches, solenoid valves, and positioners and you have a totally flexible solution for many process applications! The actuation of manual butterfly valves is still an integral part of modern process automation, as the following example demonstrates. A leading manufacturer of aggregate had a project that had not been budgeted for, but still needed to be implemented in order to comply with regulations and avoid potentially costly financial penalties. Namely, the issue was control of dust emissions on-site. The project had a number of elements that needed to be solved, not to mention the process application and location of the site. Untreated water from settling pools was being used, which was not suitable for conventional valves, such as ball valves or solenoid valves. When the water was moved, solids were mixed in, resulting in blockages and subsequent failure of the valves. The location of the site was also a testing one. Hot and dry in the summer with a damp, freezing winter resulted in challenging conditions. The system needed to be able to handle 3 bar pressure and consists of 60 manual valves, 40 actuated valves, and 4” pipework. Electric and pneumatically operated double acting actuated butterfly valves were offered for a number of reasons and in a variety of locations. Using air to power the valves is cheaper than electricity, but more importantly a supply of compressed air was already available on-site, as a compressor had been installed at the facility. An additional problem that needed to be overcome was the remote location and extreme weather conditions components would be subjected to. Pneumatic valves would not be able to be installed outside on the outlet discharge due to freezing of both the actuator and the airline, unless substantial lagging or heat tracing was undertaken. The answer was to install additional IP67 protected electrical economy actuated butterfly valves. These valves offer standard open and close electrical and optical indication, manual override, limit switches, and anti-condensation heaters. Perfect for cold, winter conditions! Solenoid valves that piloted the pneumatic actuators were housed in control panels with Burkert Type 5470 DIN rail mounted pilot 4/2-way valves supplied as part of the system. 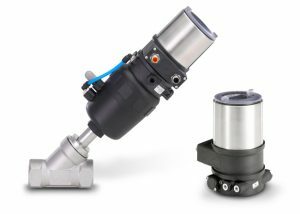 Another great example of the changing face of process automation has been Burkert’s range of Element positioners and process controllers that have taken the design and operation of many automated processes, especially hygienic applications and those that benefit from a decentralised control structure, just that one step further. Burkert continues to improve the functionality of its Type 869x positioners and controllers. Recent improvements to the range include ATEX and IECEx approvals for operation in zones 2/22 and 1/21, where potentially explosive atmospheres may exist, in addition to an extension to the ambient operating temperature range, down to -10°C. The latest diagnostic functions allow the status to be displayed using standardised symbols, according to NAMUR recommendation (NE107) as well as the ability to output the diagnostic messages using binary signals. LED lights provide an instant and more visible indication of valve status. In terms of communication, Burkert’s Type 869x range has compatibility with AS-i, DeviceNet, and Profibus, allowing controllers to be integrated into a selection of applications and process structures. Using this range of fieldbus protocols allows individual valves to be connected using just one or two cables to link back to a local controller or up a level to a factory-wide bus network. “Burkert’s Element range has become an integral part of our solution for clients seeking modern process automation either as standalone products or as part of a complete system. It is definitely a hard act to beat,” says Gary Hopkinson. 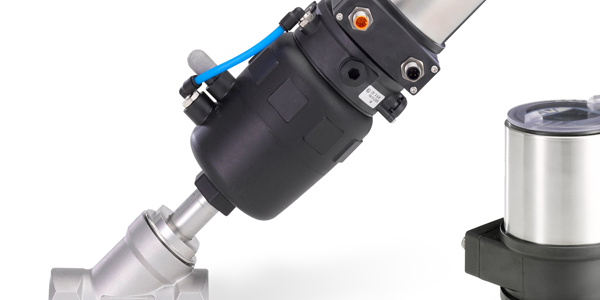 If you didn't know already Valves Online are a partner distributor for Burkert and UK-based supplier of process valves, control solutions and systems; covering a variety of applications and industry sectors including food processing, breweries, and water treatment as well as in process engineering and biomass technology. We employ specialist engineers who have comprehensive knowledge of the products we supply. For further information or should you wish to discuss valve actuation in more detail please call us on +44(0)1822 855600, +44(0)161 480 5700 or contact our technical department via email.